Please note: while this event is sold out, there may be room for you want to take your chances and come before the event starts. We hope to see ya there! What better way to spend Valentine’s Day than to join Mrs. Frank Hokum (aka Sheila Norgate) as she hosts an evening of missives on the matter of amour: passion, jealousy, heartache, love gone awry, love gone alright: heartbreak, hilarity, awkward, and emboldened. The lineup of love struck scribes includes Sandy Duncan, Debbie Marshall, Carol Martin, Susan Yates, Jean Wyenberg, Miranda Holmes, Philip McAdam, and Naomi Wakan. Join in on the fun, whether single or paired up! Wine Bar, a fabulous raffle, and refreshments available! 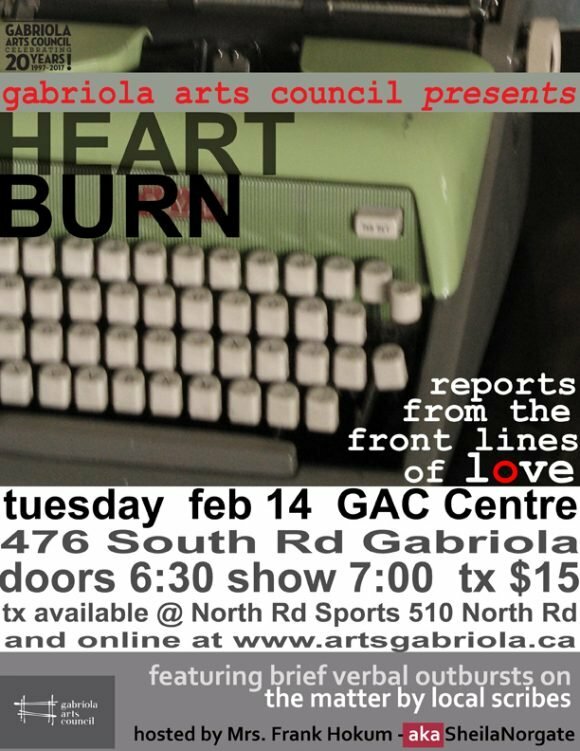 Where: Gabriola Arts and Heritage Centre, 476 South Rd.